Depending on whom you ask, eucalyptus trees are either an icon in California or a fire-prone scourge. 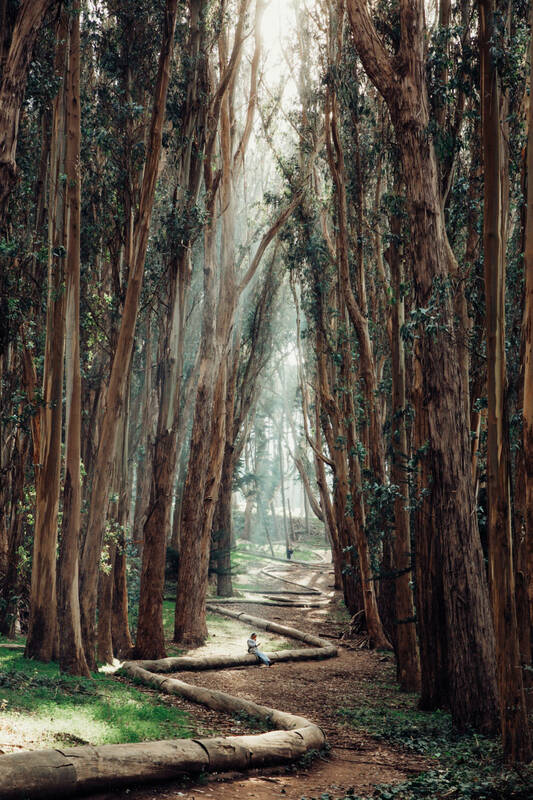 Bay Curious heard from two hikers wanting to know about the past and future of California’s eucalyptus trees. “How did all of this eucalyptus get to the Bay Area?” asked Christian Wagner, a tech worker who lives in Pleasanton. “I know that they’re invasive, so what do we do about that? Are they worth keeping around? Or do we need to get rid of them and replace them with something else?” wondered Julie Bergen, an occupational therapist from Alameda. Reaching heights of more than 100 feet, the main kind of eucalyptus you’re likely to see here is Tasmanian blue gum, eucalyptus globulus. They feature sickle-shaped leaves hanging from high branches, and deciduous bark that is forever peeling from their shaggy trunks. Some people experience the smell of eucalyptus as medicinal; others say the trees just smell like California. So how did eucalyptus trees get here? “They came here as envelopes of seeds on boats coming to California in the 1850s,” explains Jared Farmer, author of "Trees In Paradise: A California History." During the Gold Rush, Australians were among the throngs flocking to a place where wood was in short supply. The predominantly Australian eucalyptus genus includes more than 700 species, ranging from tall trees to shrubs. Hundreds have been tried out in California, but only red gum and blue gum reproduce on their own here. Besides the practical need to plant more trees, settlers who were used to dense forests also felt that the lack of trees in California’s grassy, marshy, scrubby landscape made it feel incomplete. So within a few years, nurseries in San Francisco were selling young eucalyptus grown from seed. The trees grew remarkably quickly here, even in poor soil. “In an average rainfall year here in California, these trees probably put on 4 to 6 feet in height and maybe, in their early growth years, a half-inch to an inch in diameter,” says Joe McBride, a UC Berkeley professor emeritus of landscape architecture and environmental planning. Beyond the drive to change the landscape and provide firewood, Californians also planted eucalyptus (mainly blue gum) to serve as windbreaks. In fact, that was the original purpose of what’s now the largest, densest stand of blue gum eucalyptus in the world, on campus at Berkeley, says McBride. It was planted around 140 years ago to provide a windbreak for an old cinder running track -- to keep its fine ashen gravel from blowing into athletes’ faces. The trees’ success in California owed to a lack of enemies here. Because they were grown from seed, they hadn’t brought along any of the pests or pathogens (or koalas) they contend with back in Australia. 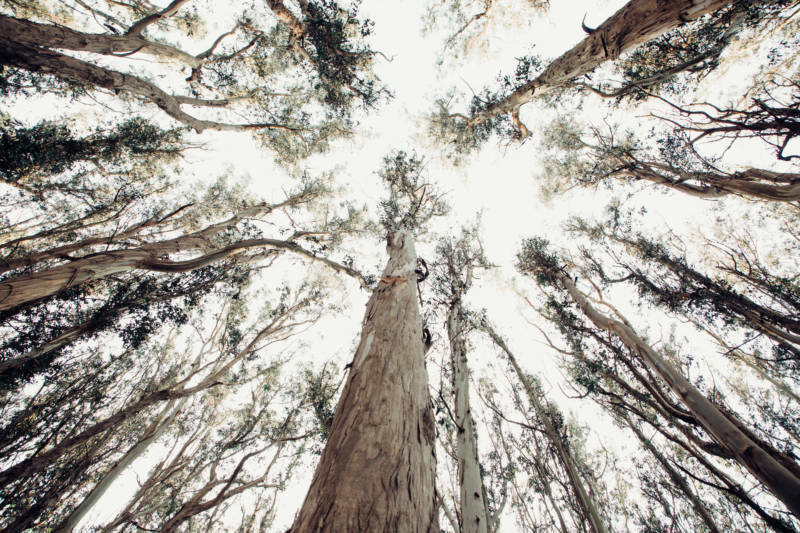 Within a few decades of its arrival, many Californians grew disenchanted with eucalyptus. Blue gum proved terrible for woodworking — the wood often split and cracked, making it a poor choice for railroad ties. The trees also proved thirsty enough to drain nearby wells. “If you go back to California farm journals of the 1870s, '80s, '90s, there’s just report after report of disappointment, like ‘these trees are no good,’ ” says Farmer, the historian. But things changed in the early 20th century when U.S. Forest Service officials grew concerned about a looming timber famine. They feared forests in the eastern United States had been overexploited and wouldn’t grow back, and predicted the supply of hardwood would dwindle over the next 15 years. This played out as a speculative frenzy — a bubble. Boosters began selling plantations dense with eucalyptus — hundreds of trees per acre. Farmer writes in his book that claims were made like: “Forests Grown While You Wait,” and “Absolute Security and Absolute Certainty.” In just a few years, millions of blue gums were planted from Southern California up to Mendocino. The anticipated timber famine never came to pass. Forests further east proved more resilient than expected, and the need was offset by concrete, steel and imports, like mahogany. Ultimately, the thousands of acres of eucalyptus planted around California were not even worth cutting down. Much of what you see today is a century-old abandoned crop. What’s fire got to do with it? Eucalyptus trees have lovers and haters in California. 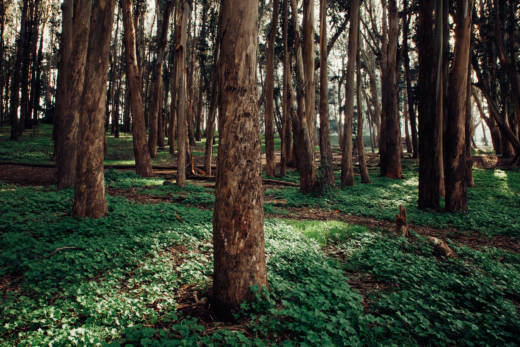 A big part of the debate over whether the trees should be allowed to persist here traces back to the East Bay firestorm of 1991, which left 25 people dead and thousands homeless. Vast swaths of eucalyptus burned. Because the trees shed so much bark, critics argue they worsen the fire hazard and should be cut down. Defenders point out California’s native plants also have a tendency to burn. Both say the science is on their side, but so far no landmark study has shut down the dispute. That ongoing dispute is also politically entrenched. A few years ago, federal funding to cut down trees in the East Bay hills was rescinded, after protesters got naked and hugged the eucalyptus trees on campus at Cal. Not all non-native plants capable of reproducing on their own do it enough to have an ecological impact, Yost says. “As soon as it starts outcompeting native species or fundamentally changing the environment so that native species can’t grow there, we would consider that an invasive species," she says. 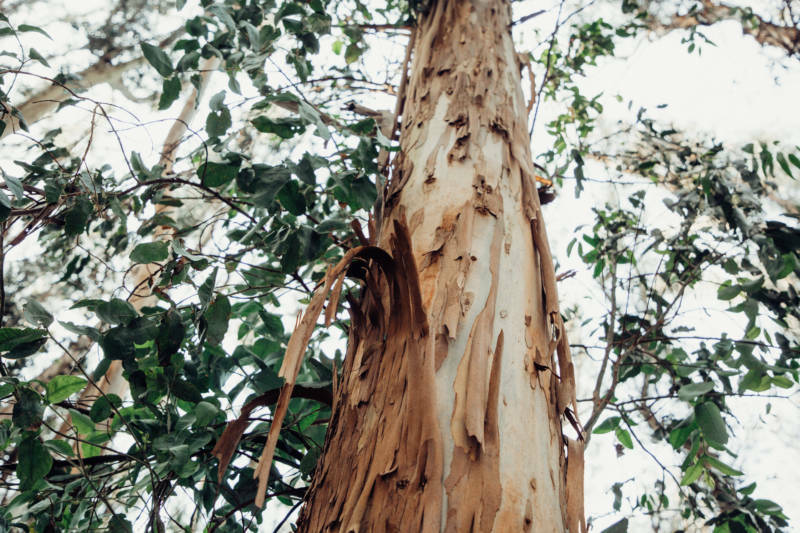 With an estimated 40,000 of eucalyptus planted across the state, the trees aren’t easy to get rid of. Slicing down a large blue gum near a building can require a crane, at an expense of thousands of dollars. And keeping them from resprouting can also be its own chore. 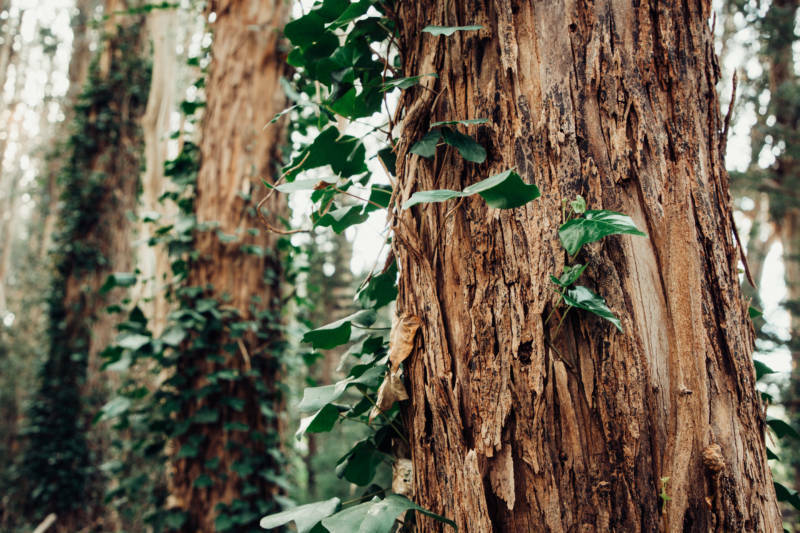 Long term, as the climate changes over the coming decades, it's possible the aging eucalyptus groves that don’t get enough water to reproduce will begin to die. Then again, if the state becomes hotter and drier, it may become the type of place where some Australian species are able to thrive.